Mark Lamarr is quoted as saying “Everyone has four good stories, Neville Staple has the rest!” And spending time with the 2 Tone legend you can see where Lamarr is coming from. His is a life that has involved moving to a new land (bringing his culture with him), brushes with teenage criminality and changing British popular culture in two seminal groups – The Specials and Fun Boy Three before acting as an inspirational figure for the US ska revival of the 90s. How could he not have stories to tell? Even as our chat finishes in the backstage area of Derby’s The Venue, where Staple and his band are about to drop a bomb of pure ska joy, he launches into an explanation of his ‘friend Amy’ and how special she was to know and perform with. That Amy was, of course, Amy Winehouse who performed live with The Specials at V Festival. My recorder is off, the interview has finished but it is clear Staple could talk all night and never stop being interesting. Currently he is promoting a new album The Return of Judge Roughneck which straddles the history of Jamaican music from ska to dub, all with Staple’s punky edge. As with everything he has done this homage to his heritage was quite deliberate. The question posed about the genesis of the new record morphs into a short history lesson about his relationship with music. It is this ‘chatting’ that led to his involvement as front-man of one of the most important bands ever, The Specials. Their music, style and the label they started 2 Tone brought ska into the mainstream consciousness of Britain and changed culture forever. “That’s how I got into the Specials, I was chatting on an instrumental record. When The Specials were playing at Crystal Palace with The Clash when they first started, I did what I used to do over the instrumental, just chatted over the track and that was it. And it is an undeniable fact the Staple’s input and energy is an integral part of the fabric of the 2 Tone sound and what made it explode. Nowhere is this more apparent than live on stage where he has the reputation as one of the most energetic performers around. This is still evident during his blinding set following our chat, the passing years means he no longer launches himself off speaker stacks but the passion, energy and charm is more than present. “Because on stage you have the energy. On stage I feel it, on record you can’t tell. In this band I have now, we’re all in it together and you can just tell we are having fun. I didn’t get that feeling in the Specials the second time around,” explains Staple. He is explaining his departure from The Specials reunion in late-2012, that left some people baffled. Why leave the lucrative nostalgia bandwagon? And peddling the past is not something that The Original Rudeboy is about, he is always about moving forward. And witnessing the current Neville Staple band, with members travelling from all over the country to bring the ska excitement, it’s easy to see he has a point. This band is nothing but ‘spark’. His shows are an all-ages lovefest for the brilliance of ska, past and present, which really is Staples’ legacy in all this. As the music is passed down generation to generation, it means different things to different people (from the danceable beat to the social messages) he continues to be a salesman for it all. In fact, he was front and centre of the last big explosion of ska in the 1990s, across the pond in the US when a more American ska-punk aesthetic was taking hold. And now in 2017 how is what Staple has to say still relevant? The answer is ‘in the same way it always has been’, social messages (many of which reflect the dark times we again find ourselves in) have always been woven into the fabric of his music, but never as a sermon. In our new age of austerity it is easy to see relevance in some of his biggest hits like Fun Boy Three’s ‘The Lunatics Have Taken Over The Asylum’ or the chart-topping, era-defining ‘Ghost Town’. And it still certainly resonates today. It’s not all about the negative things, Staple has a sense of humour and a romantic heart as can be heard on new album track ‘Be Happy’. There is a sweet message hidden in the tongue-in-cheek humour. 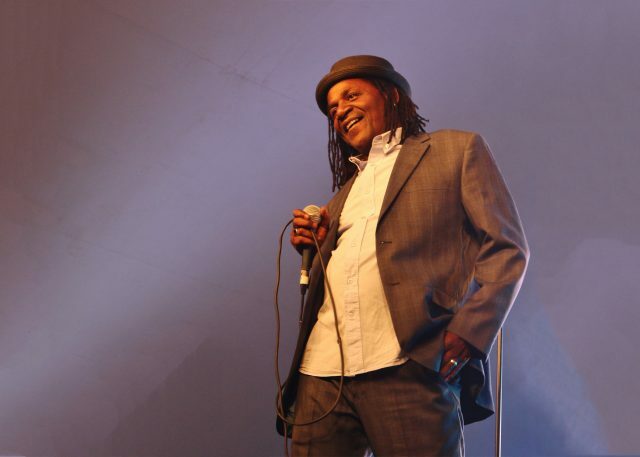 What is in Neville Staple’s heart is ska and he continues to bring the classic genre to life, all ways on his own terms. As the tape recorder is turned off Christine, manager and wife, continues to explain the work that they now do in schools inspiring children with music – another layer to Staple’s devotion to positivity of ska. With this new album out in the world and a UK tour under his belt the live-stint continues with Hong Kong, America, Spain, Argentina, Canada, Japan and ‘whatever comes up’. With this much activity, we may find that Staple ends up stealing the other good stories off everyone as well! The Return of Judge Roughneck is out now and also available on all good streaming services. Originally published by The National Student.